Find all of the forms you need to enroll, transfer, register, change majors and graduate all in one place. The Academic Petition Form is for students seeking exceptions to academic policy. Examples include adding/dropping a class after the add/drop period, graduation requirement exception, etc. Department chair, college/school dean, athletics department representative, If adding a course will increase the student’s maximum allowed course load, the dean of the student’s college must also sign the form. If the student is an athlete, a representative from the athletics department must also sign the form. For new staff/advisors/faculty or for employees transferring into a new position that requires a revision to their current Banner security access. Students can make address changes via the Samford Portal, in person at the Office of the Registrar, or by mailing or faxing the Address Change Form to the Office of the Registrar. Permanent mailing addresses cannot be changed to a student’s SU Box or on-campus address (i.e., residence hall). “Permanent” addresses must be off campus. An application for graduation must be completed by students who expect to graduate in the current or upcoming term. A $100 mandatory fee is assessed to all students who graduate. This fee covers all the costs of seven commencement ceremonies in December and May, including caps and gowns for all graduates, diplomas, and programs. After selecting "Submit Application" below, please select the "Term Selection" link to begin your application. The audit status form is for regular or special status students who elect to complete a course under the audit grading mode. A credit course may be changed to an audit basis any time prior to the deadline to withdraw from a course without academic penalty. An audit course may be changed to a credit basis any time prior to the last day to add a course in a semester/term. (See the academic calendar for those deadlines as they apply to the current term/semester.) Students cannot audit courses above the 400-level. The BACHE Student Exchange Program Form is for Samford students planning to take a course at one of the participating BACHE schools: Birmingham-Southern College, Miles College, University of Montevallo , or the University of Alabama at Birmingham. The catalog requirements change request is for students petitioning to change the catalog year under which their degree is associated and under which they are slated to graduate. The Change of Academic Program form is for students changing or adding/dropping a major, minor, or concentration. As stated in the current catalog (under Graduation Requirements), students are required to meet all requirements “in effect at the time of entrance into the major.” For example, if a student enters Samford in 2012–2013 but changes majors in 2014–2015, then 2014–2015 is the catalog year in effect for the new program. This applies to majors, minors, and concentrations, unless special circumstances require the student to remain under a specific catalog year. To petition to change the catalog year, a student must complete the Catalog Requirements Change Request. The Change of Academic Program form is also used to submit a new expected graduation date, or for students who are changing from the day to evening program (Evening College) or vice versa. Form requires the signature of the new advisor only in the case of a new or added major. Due to new fee assessment rules, change of major forms turned in after the initial add/drop period (first week of classes) will be made effective for the next academic term. (For example, if the form is submitted in October or November, the change will be made effective beginning Jan Term/spring.) New advisors will still be able to provide students with their registration alternate PINs and students will still be able to register for major-specific courses for those future terms during the early registration period. The adjustment in procedure was made to avoid students being assessed fees applicable to specific majors after the term has started. If the student is new to Samford and has not yet registered for classes, changes of major should be made through the Office of Admissions. Use of the form is not required at that stage. Contact the Office of Admission for more information. Once the student has registered for classes, the Change of Academic Program form is required and should be submitted directly to the Office of the Registrar. The Change of Incomplete Grade or Final Grade is available in the Office of the Registrar to faculty and staff only. Currently enrolled students who have legally changed their name may request their records be updated by submitting a Change of Name form to the Office of the Registrar. Law students may change their name by contacting the Law Records Office at 205-726-2044. Alumni should request a name change using the Update Your Information form. The course repeat petition form is for students who wish to repeat a course in which a “C-” or lower grade was earned. The form cannot be used to repeat courses in which the student earned a C or higher grade, nor can it be used for more than 16 credit hours. Pay close attention to calendar deadlines as printed in the catalog. The course withdrawal form is for students withdrawing from one or more (but not all) courses in the current semester/term. Student, advisor, instructor(s) of course(s) being dropped. If the student is an athlete, a representative from the Athletics Department must also sign the form. Student-athletes who drop below full-time risk losing eligibility to compete, practice, or participate in any athletic-related activities. For any student, dropping below full-time status could impact financial aid, scholarships, and/or insurance coverage. Students can add/drop courses via the Web through the last day to add or drop--without financial penalty—for that semester. After that deadline, they will be required to complete a Course Withdrawal Form and bring the completed and signed form to the Office of the Registrar for processing. Pay close attention to deadlines as noted in the academic calendar. Withdrawing from a course prior to the deadline for withdrawing without Academic Penalty does not affect a student's GPA. A “W” will appear on the transcript for the class from which he/she withdrew. Withdrawing from a course after the deadline for withdrawing without Academic Penalty does affect a student’s GPA. A “WF” will appear on the transcript for the class from which he/she withdrew. Please consult the Academic Calendar for the withdrawal deadline for the current semester/term. The grade change form is available in the Office of the Registrar to faculty and staff only. The pass/fail form is for students (sophomore, junior, or senior only) who elect to have a course changed from a standard letter grade to a pass/fail grade basis or vice versa. This form must be completed and submitted by the deadline to withdraw from a class without academic penalty (see the academic calendar for exact dates) and cannot be used for courses that are required in the core curriculum, general education curriculum, or for major/minor/concentration requirements. Pass/fail courses can be applied toward the upper-level credit requirement (min 40 UL credits for a bachelor's degree). Students may elect to receive a pass/fail grade instead of a letter grade in no more than 12 credits of regular coursework, however. Certain internship and externship courses may be taken for pass/fail credit only. Credits earned in these courses may count toward the major/minor and are not included in the 12-credit limit. The preferred name change form is for students who go by a different first name than the one officially on their record. Students can initiate a preferred name change by using this form. This change will not affect actual e-mail addresses, but will alter the way the student’s name is represented in the email address lookup feature and the From line, allowing for greater recognizability and less confusion. Students who complete this form in person must bring a photo ID. Students who choose to mail or fax the form must provide a photocopy of a picture ID (license, passport, etc.) along with the request. Changes will be made to preferred first names only, not surnames. For students registering for a class for which there is a restriction (time conflict, seat limit, co-requisite, etc.). For students who need the RPTS permit code (to repeat a course), see also the course repeat form. In most cases you can use the same form to acquire permission for the permit override plus permission to repeat the course from your advisor and the dean of academic services. Be sure to register for the course yourself as soon as the permit has been entered, then submit the signed form to the Office of the Registrar. Please note that the course repeat form is only to be used when repeating a course in which the student earned a grade of C- or lower and if/when the student is attempting to have the first grade earned omitted from GPA calculation on the student's record. It cannot be used to repeat courses in which the student earned a C or higher grade, nor can it be used for more than 16 credit hours. For all other permit overrides, or to repeat a course that doesn't meet the criteria noted above, use only the Registration Permit Override Request form below. Samford University is committed to providing a student environment conducive to students’ growth and personal development. The student complaint form is to be used by any student who wishes to file a grievance about his/her perceived treatment/interaction with a member of the university community or a service offered at the university. The substitution/equivalence request form is for students who wish to fulfill a graduation requirement with a course other than the one specified in the degree plan, including courses transferred in from other colleges. Requests for transcripts, grades, GPA, or other information, such as courses completed, cannot be issued to an outside party unless the student has given the registrar written permission to release this information to the specified party, as allowed under The Family Educational Rights & Privacy Act (FERPA). Transcripts are generally available or mailed within one-to-two business days from receipt of the request. During peak times—i.e., registration, beginning of a semester, graduation—response time may not be as expedient. During such times, please allow for additional processing time. Transcript requests will not be honored if the student is indebted to the university. Any student aware of a transcript hold should contact the Bursar’s Office at (205) 726-2816 to clear the hold prior to requesting a transcript. Please use this option only for transcripts that are to be mailed. Please be sure you have the complete mailing address before you begin your request. Click on Request Official Transcript and enter the name of the person, school, or business where the transcript should be sent in the "Issue to" block, then click Continue. Enter number of copies needed, select in-progress cut-off term (selecting the most recent term will show the classes in which you are currently enrolled on your transcript), when to print the transcript (ASAP, hold for grades, hold for degree, etc.) and delivery method, and click Continue. You can review the status of your request on the Office of the Registrar screen, by clicking on View Status of Transcript Requests. If you have any questions, please feel free to call our office at (205) 726-2911. Alumni and/or students without portal access can request transcripts in person or by submitting a Transcript Request Form to our office. Transcripts can be mailed directly to you or to another recipient (school, employer, state board, etc.). Transcripts for coursework completed prior to 1987 may take longer to process than the usual one-to-two business day estimate. This form is for students who plan to attend summer classes at another institution. It is not to be used for study-abroad students who plan to take a course at a foreign college/university. There is a separate transient enrollment request for study abroad students. This form is for students who plan to attend classes at a university in a foreign country through an institution other than Samford. It is not to be used for those who plan to attend domestic universities. Complete top of form and fill in information concerning the class(es) you plan to take. (Print more than one copy if you need additional course information blanks; do not use the back of the form.) Be sure to include the complete name and address of the school you plan to attend. Core courses may not be taken. Obtain signature approval from your academic advisor first. If you are a senior you must also obtain your dean's signature approval. Upon completion of 96 credits students may not transfer more than 8 semester credits or two courses to Samford. To receive a degree, students must earn at least 50% of their total credits from Samford. Obtain signature of the director of International Programs. Obtain signature of the department head representing the class you plan to take. (Attach a readable and highlighted copy of the complete course description from the catalog of the college where you plan to attend classes before you obtain the department head’s signature.) Davis Library has copies of college catalogs and many are also available online directly from the college/university itself. Return completed transient enrollment form to the Office of the Registrar with your signature. It is your responsibility to obtain all necessary signatures. 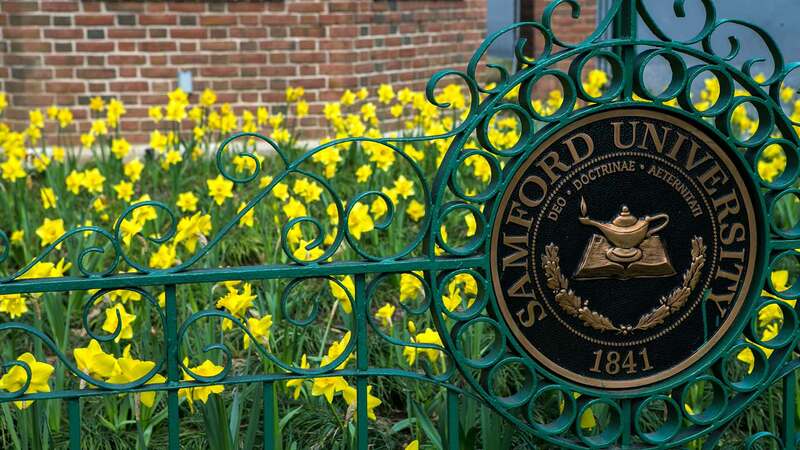 Both your Samford (Institution) and overall GPAs must be at least 2.0 at the end of the current semester in order to have a letter of good standing sent to another college or university. To have a letter of good standing sent before the end of the current semester a student must have a minimum of a 2.50 GPA. Study abroad students are responsible for requesting an international transcript evaluation from AACRAO or WES. Requesting an international transcript of the final grade(s) from the other school be sent to Samford is optional, although encouraged. All courses from transient schools are required to have a letter grade of C- or better in order to be posted as earned credit on your transcript. International transcripts should be sent to Nancy Bales in the Office of the Registrar, Samford Hall 214. Return the completed form to the Office of the Registrar, or fax to 205-726-2908, if you are facing an impending deadline. The trial study form is for students who are registering for classes. Obtain an alternate personal identification number (PIN) from advisor (PINs are term specific). Completion of this form does not automatically assume the student is registered for the semester. In most cases, students will register themselves on the web using this form as a guide. A signed copy should be retained by the advisor/department. The Veterans Administration request for certification form is for students with military service or who are dependents of military personnel. Students wishing to participate in a commencement ceremony prior to completing their degree requirements should fill out the below form. Undergraduate students must be within 8 credit hours of finishing their graduation requirements, have a C- or better in UCCA 102, and fulfill all Convo requirements before submitting this form. Graduate students must be within 3 credits of graduating. Law students must be within 5 credits. Please note that the deadline for having your name included in the commencement program is the same as the deadline for withdrawing from a course without academic penalty, as stated on the official academic calendar. The withdrawal request form is for students withdrawing from the current semester/term or from a future semester/term for which they are preregistered. Although registration and drop/add is available via the Samford Portal, students will not be able to withdraw completely from all courses via the web. Students who wish to withdraw completely from the semester must complete the form and mail, fax, or deliver it in person to the Office of the Registrar. Undeclared or Arts and Sciences Undergraduates must obtain the signature of the assistant dean, Arts and Sciences, Dean’s Office, Brooks 127, (205) 726-2216. All other undergraduates must obtain the signature of their program advisor. Student-athletes must obtain the signature of the athletic administrator, regardless of their classification (freshman, sophomore, etc. ), and in addition to that of their program advisor (if different). All undergraduate evening students (Professional Studies) and all graduate/professional students (except Law) should obtain the signature of their program advisor. It’s recommended, however, that Professional Studies and graduate students contact their respective college/school first when planning to withdraw. The withdrawal request form is for law students withdrawing from the current semester/term or from a future semester/term for which they are preregistered. Law students must go through the Cumberland School of Law to withdraw. Although registration and drop/add is available via the Samford Portal, students will not be able to withdraw completely from all courses via the web. Students who wish to withdraw completely from the semester must complete the appropriate form above and mail, fax, or deliver it in person to the Cumberland School of Law.